We are in a week where lots of passionate discussions about the environment and its stewardship will be aired. Many activities will be carried out in the name of Mother Earth and many more photo opportunities created in the name of environment. There will be a lot of appreciative discourse about the future generations to come rather than addressing the selfish needs of the present generation. Businesses may briefly talk about what the future needs than what the market demands and some may actively readjust their directions. World Environment Day is on 5 June and the whole world will definitely celebrate this day. There is a definite need for some quick action right now as we celebrate yet another Environment Day. We witness the frequency of extreme weather events going up. In neighbouring State of Andhra Pradesh in India we are hearing of nearly 3,000 losing their lives simply due to an unexpectedly severe heat wave. To an unprepared country or a region, an extreme event can mean really extreme challenges. That is what one sees if a Richter scale 7.0 event were to hit Kathmandu instead of California. Yet the preparedness can only be done to a certain extent. The triple whammy effects at Fukushima – earthquake, tsunami and the nuclear reactor failure – are still haunting the Japanese society. The problems from the nuclear reactor failures are yet to be fully resolved and disturbing news such as hydrogen build up, radioactivity leakage to sea, issues of medical concerns and food contaminations keep on coming through the news media. We have enough scientific knowledge and technological capabilities to change course and achieve a different growth pattern. This is what is being demanded today though the majority of decision makers seem oblivious to the need and are still seduced purely by market capitalisations and GDP growth rates. Another round of climate change discussions are currently underway in Bonn, searching for some global consensus. Representatives from 195 countries are negotiating the final text of the climate change agreement going beyond Kyoto. The new agreement is expected to be signed in Paris this December. The negotiation brigade continues to move from one luxury location to another and it is questionable whether these locations really provide the necessary background stimuli for reaching a consensus. This year’s theme for Environment Day is ‘7 billion dreams, one planet and consume with care’. The number of dreams is definitely conservative and the one planet is certainly not in dispute. It is the quest for consumption fuelled by the ‘dreams’ that is at the heart of the issue. We know that we cannot sustain the planet if we keep to fulfilling dreams in the current manner. The path surely will lead to nightmares. One area where we have to apply the principle of consume with care is in buildings – where we spent most of our time dreaming both night and day! Buildings consume significant resources. Once built they continue to consume resources. As the lifespan of a building is measured in decades, how a structure is designed and built and its functionality impact on the environment for years to come. Having recognised the consumptive role of buildings in the resource space, today there is much interest and drive in going for green buildings. Once a building is built as per ‘green norms’ there is the need for certification through an external body. One certification scheme is presented by the United States Green Building Council – LEED scheme. LEED, or Leadership in Energy & Environmental Design, is a green building certification program that recognises best-in-class building strategies and practices. Each of these buildings convey a message of responsibility to the environment and resource conservation and consume with care is at the heart of the process. This is considers to be the world’s premier benchmark for high performance buildings. To receive LEED certification, building projects satisfy prerequisites and earn points to achieve different levels of certification. There are other schemes in existence and Sri Lanka has its own more relevant scheme too implemented by the Sri Lanka Green Building Council. As all these schemes are voluntary the preference to reach out for a particular certification body is entirely up to the user. The Nanotechnology Centre of Excellence at Pitipana, Homagama has been awarded the Platinum LEEDS rating on 30 March. The Platinum award is the top most rating award possible and is quite challenging to receive. This is a singular achievement as to date out of 855,680 buildings in the world only 0.5% of the LEED certified buildings have achieved this top rating. It is indeed a distinction that the team SLINTEC with building designers, architects and project management team had achieved this exceptional award. 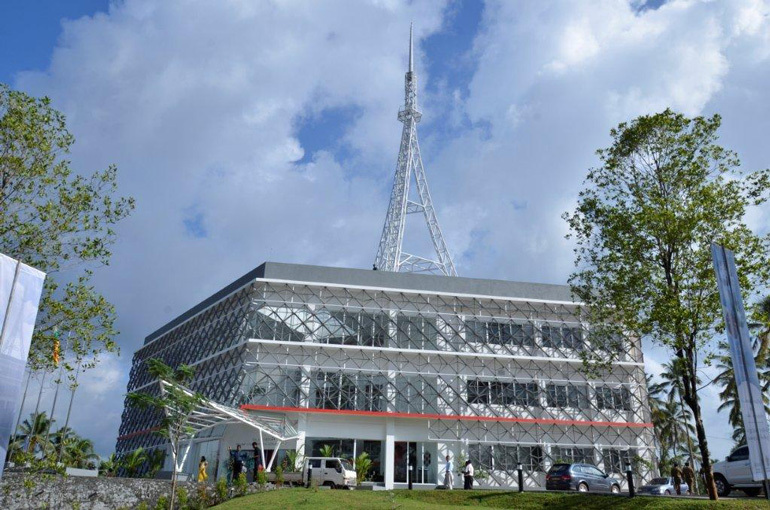 The Nanotechnology Centre of Excellence is a 52,397 sq.ft facility and it is the first laboratory in Sri Lanka to achieve this status. Sri Lanka as at now has 29 LEED certified buildings. Looking at the LEEDS database, it clearly indicates this is the only nanotechnology laboratory in the world to have secured this certification. To achieve this rating, the environmentally-positive interventions have to be significant, well-thought-out and executed. It is equally important that responsible development is carried out from the very beginning. This building is green because it has green activities that achieved outcomes of energy efficient design, water use reduction, sustainable site selection and development, responsible materials selection and waste management, and enhanced indoor environmental quality. Beside all the top end research into nanotechnology, with this new recognition the building itself has become a place worth looking at. 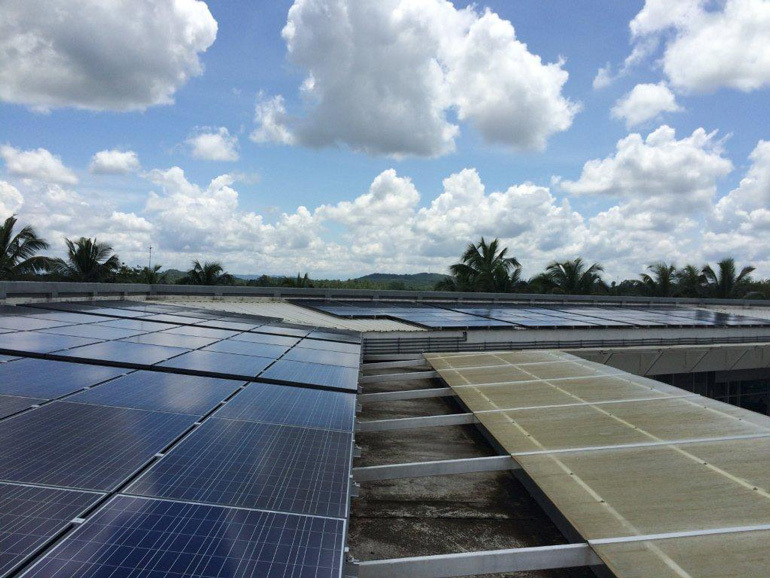 The building harnesses the abundant solar energy, thus freeing to a considerable degree (20%) the CEB from having to supply the demand. 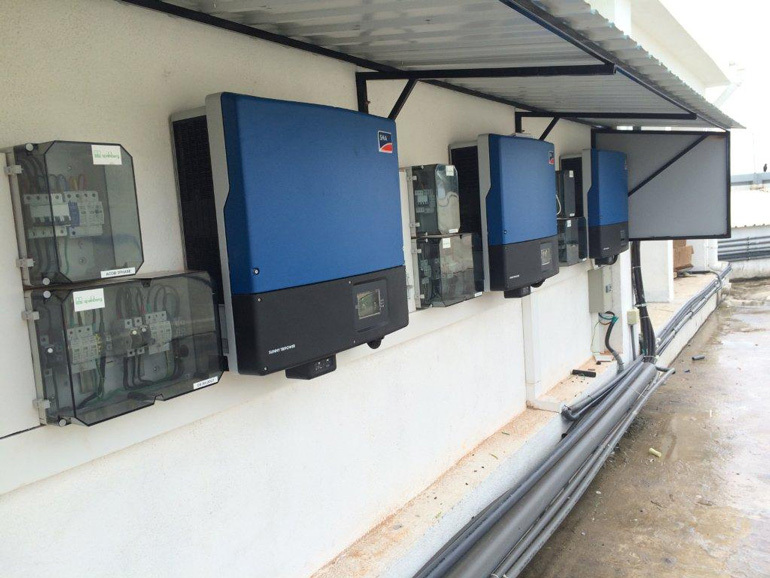 The CEB today will receive renewable electricity from the building instead at times as net metering is in place. 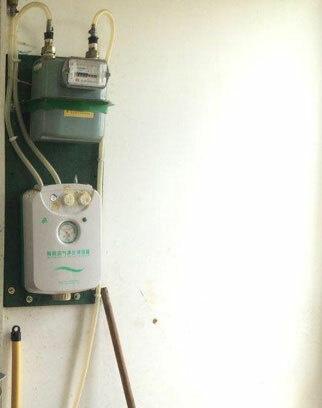 The biowaste is turned into biogas and the researchers will enjoy meals cook from biogas. That reduces considerably the LPG requirement. 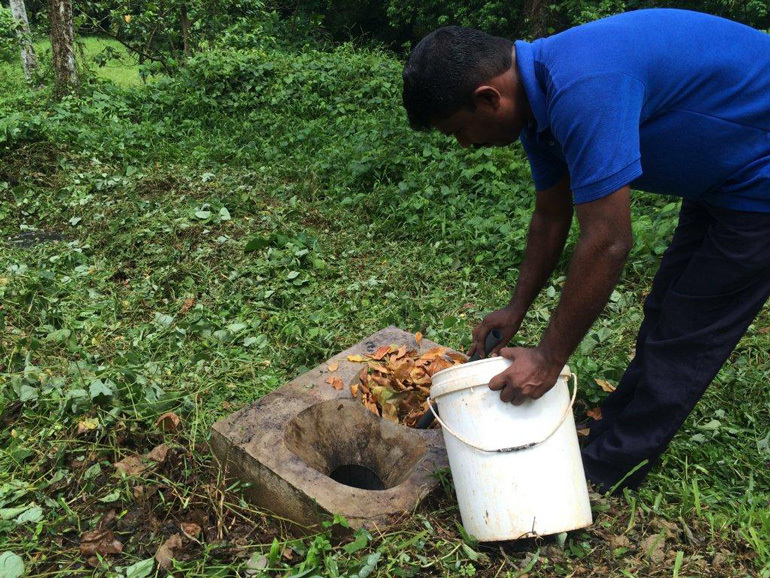 Gardening waste too ends up in the biogas digester. It is a real pity that biogas option is not looked at as a solution for the urban biowaste. Rain water is harvested and innovative nano material coated bulbs do zap pollutants in air within the building. Harvesting solar energy for electricity judicious management of sunlight means that the air conditioning burden is very much reduced along with daylight demand. 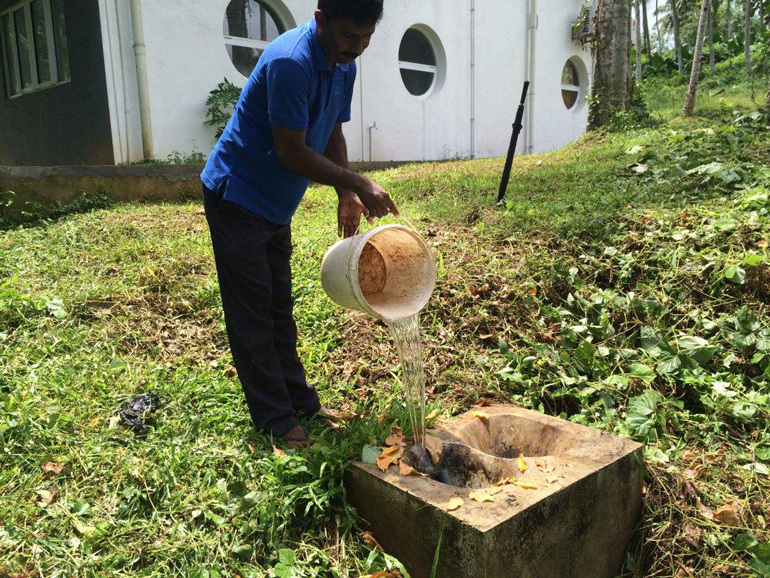 Wastewater is recycled and is used for gardening after treatment. 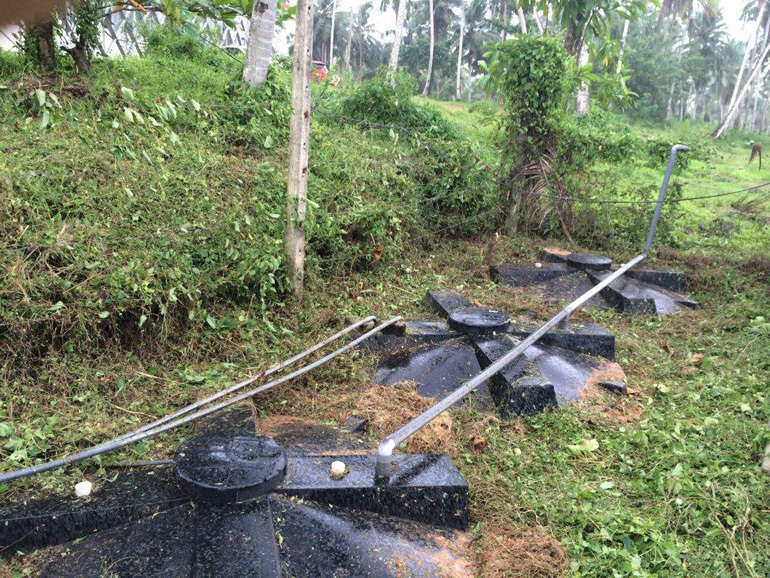 Biogas system provides fertiliser for plants after digestion. 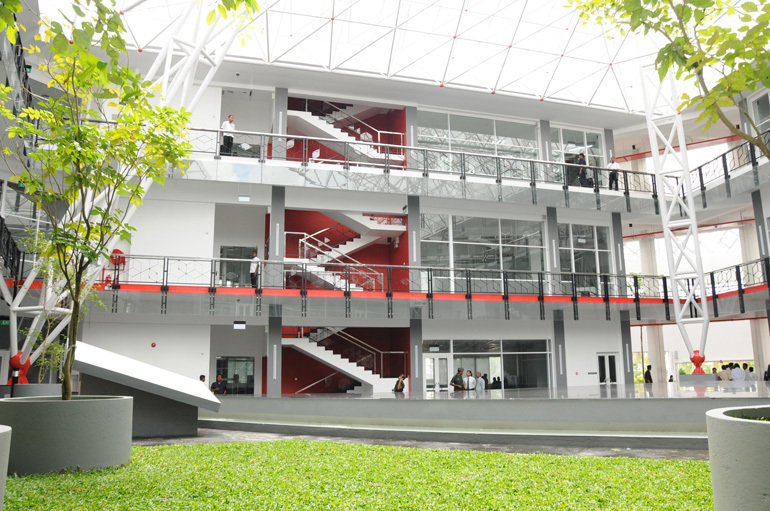 The building complex is indeed a building that exudes green confidence! There is of course more opportunities for nano innovations to adorn the structure in time to come. Additional advantage of buildings going green is that the occupants will immediately realise some health benefits. Bad indoor environment significantly increases the risk of occupant health problems. The materials of choice in green buildings are quite benign and are much healthier alternatives to products which contain solvents and petroleum based chemicals. Also with ventilation under much better control the reality of ‘sick building syndrome’ will not haunt the occupants. Most of us are rather ignorant about this indoor air quality issue and glamorous design, cushions and colours are identified to be synonymous with ‘class’ – an unfortunate display of ignorance. How much we owe our buildings for the present ailments that we face is not really quantified but never to be disputed. The benefits to productivity in this type of research setting can really be a big bonus. Structures are a symbol of humanity. We go into extreme ends to design and build structures and then deploy resources extensively to make the insides liveable and comfortable. These have together become significant consumers of our limited resources. As we really do not have an alternative to structures, the way forward is ensuring they become pillars for sustainability. It is indeed nice to witness a building from our midst that is considered to be in the top 0.1% of green buildings as per the LEEDS certification. The foundations of Sri Lanka Institute of Nanotechnology are thus having a lighter footprint on earth. We know that there is work of extreme importance going on within. Well within the building the research into nanotechnology was initially started with the tag line ‘Sustainable Nanotechnology’. Again Sri Lanka was the first country to explicitly indicate NT research with the sustainability focus among all national nanotechnology initiatives. It is heartening to note that the words of yesterday are matched with deeds. I am not saying that the work towards sustainable nanotechnology is completed but indeed the work in progress is inspiring!